When it comes to childlessness among women nearing the end of their childbearing years, the U.S. ranks near the top of the list compared with 117 other countries or areas with 100,000 or more inhabitants, according to a recent United Nations report. Among 118 places with comparable data, only six have rates of childlessness higher than the U.S. rate of 19%. Singapore tops the list, with a childless rate of 23%, followed by Austria, the U.K., Finland, Bahrain, and Canada. Liberia and Congo report childlessness rates below 2%, although the UN states that childlessness typically doesn’t dip below 3%, so these values should be viewed cautiously. Women ages 40-44 in the U.S. have, on average, about 1.9 children in their lifetimes—one of the lowest levels of 171 countries analyzed. Only 19 places report lifetime fertility levels at or below 1.9. In Germany and Ukraine, the average is just 1.6 children, while at the other end of the spectrum, women in Niger bear 7.8 children on average. While these measures highlight how low U.S. fertility rates are compared with other places, U.S. women fall squarely in the middle range when it comes to the age at which they first become mothers. 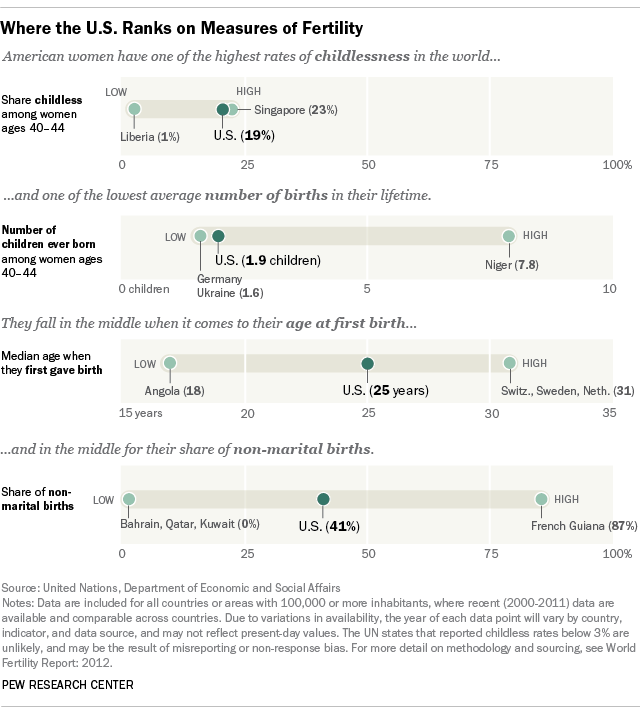 The UN reports the median age at first birth is 25 years for U.S. women, while at the extremes, the ages range from 18 years for new moms in Angola to 31 years for new mothers in Switzerland, Sweden, and the Netherlands. In terms of non-marital births, the U.S. ranks 49th among 91 places with comparable data. While 41% of all U.S. births occurred to unmarried women, the rates worldwide ranged from less than 1% in Bahrain, Qatar, Kuwait and Albania, up to 87% in French Guiana.